He argued that in an attempt to build individual freedom, privacy, and independence into the urban landscape, the city’s planning and architecture instead reinforce loneliness and isolation. We can see evidence of life happening around us, but feel shut out of the private lives of others. 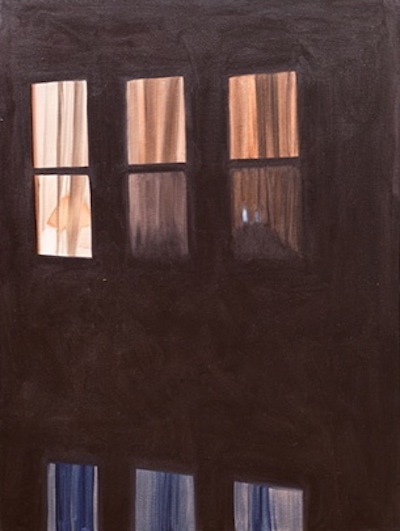 Zabicki’s work takes what is briefly glimpsed, hinting at the lives of others who will forever remain unknown to us. 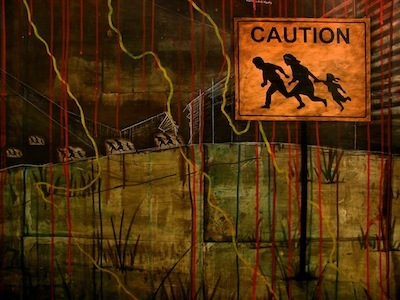 Artists for Radical Change use painting, drawing and mixed media installation as tools to manipulate images and capture moments and events undocumented by the media. Members of the collective collaborated with community organizers and activist organizations over a period of several years to deepen their understanding of the political economy of public education. 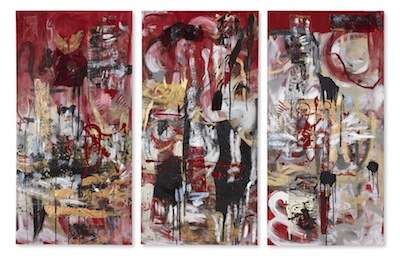 These works resulted directly from board meetings, school closing hearings, protests, demonstrations and marches from neighborhoods and areas throughout Chicago. The bright and bold colors of these works emulate the energy, anxiety and tensions felt at events by the artists throughout this experience. The events were physically and emotionally stressful and the threat of arrest was constantly present. Alicia Obermeyer uses thrift stores as a source for materials that embody evidence of human life in contemporary habitats. In the past, she has created anthropomorphic sculptures that evolved from an accumulation and manipulation of these found objects and materials. For this project, she will be creating a site-specific relief drawing with locally thrifted bed-sheets and masking tape. Her process will include a series of automatic drawings made while observing movement during rehearsals at En las Tablas Performing Arts, which will inform the composition of her window display. Obermeyer lives and works in Chicago. Special for Chicago Artist’s Month: In a creative collaboration, students of Evelyn DeJesus’s class at En Las Tablas Performing Arts will use expressive movement in a performance that will challenge conventions of beauty. The dance will begin on the sidewalk in front of Art on Armitage at 4125 W. Armitage Ave. and will travel several doors down to En Las Tablas Performing Arts at 4111 W. Armitage Ave. The event is free and open to the public. Dukkha is a Buddhist term for suffering or unease, the state of anxiety endemic to the human condition. Known as the First Noble Truth, Dukkha is the condition Buddhists believe we must accept as true before we can begin the path to redemption. Dukkha is an adult interpretation of a favorite childhood pastime. For those unfamiliar with paper dolls, the tabs are usually folded under to hold the outfit, or persona, on the doll. I have left them extended here. References are drawn from philosophy, art history, anthropology, literature, botany, and many other disciplines, as well as my own life experience. The goal is 100 personas, a reference to The Hundred Dresses, a children’s book by Eleanor Estes. Originals are not for sale. For prints, contact the artist. This painting was made from a photomontage of pictures I took with my phone of concocted spectacles like Macy’s window displays and neighbors’ yards strewn with Christmas lights. The qualities of the staged and synthetic are very intriguing. They beg the question, “why?” I am interested in extravagance, but cannot fully have contempt for extravagance because I enjoy it to a point. Sometimes, I ignore this contempt when I work; I cake on paint, suffocate with sequins, and blind with gold. The contempt always returns. Just like when one eat too many sweets, one must stop to digest. This is similar to what happens with my painting process. Many people I have encountered, and the society in which I live, look at endless indulgence or desire and have negative reactions. There is something terrifying about the thought of a loss of control; loss of the sense of knowing when something is overdone. A painting itself can even contribute to this display of temptations. I like to work with paint and wood. I have had creative ideas using other media, but wood has become the most useful expression. 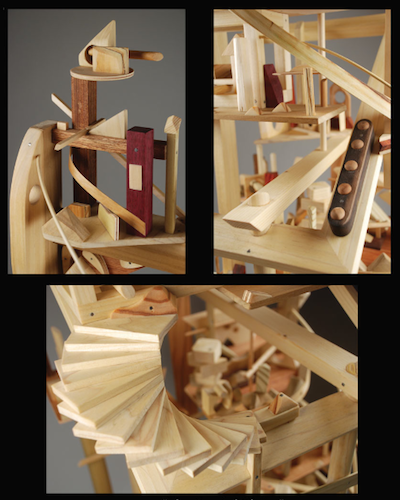 I have named my pieces “Construction Sculptures” to separate them from what most think of when referring to sculptures. Because of their architectural feel I introduced the term “construction” to give them some identification. The linear cohesiveness of the space and shapes takes on many aspects of architectural design. Illusion and deception. One door opens, another one closes before their eyes. In the silence of the night, "mojaditos" crying as they cross the line. The "coyote" is on the run. They don't understand why. Dream and reality is their wonderland in disguise. Someone's children, anonymous shadows to the rest of us. Thousands of unspoken and ignored inconveniences. One bleeding border, one more night. This installation raises awareness and gives voice to the thousands of unknown children that have lost their lives trying to cross the US/Mexican border. 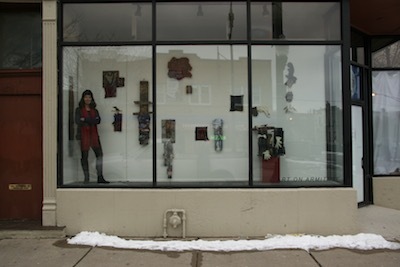 During the month of April, ART ON ARMITAGE window gallery will present an installation by former Chicago Art Department artists-in-residence Stacy Peterson, Pei San Ng and Amie Sell. This collaboration explores the Golden Age, the era that we are just waking up to. It is a time of unity, harmony and prosperity. This concept evolved from a trip to Creative Reuse Warehouse with the aim of constructing an art installation made of recycled materials. Using leftover industrial hardware and metal wires, the parts were woven together to create connections, building something bigger than the single item. The nebulous cloud shapes are a visual representation of how people work together to create communities and social networks as well as how molecular structures build. It is also a play on cloud computing which relies on the sharing of resources rather than storing information on local servers. A wholeness or oneness is created out of the individual pieces. And in the words of Aristotle, “the whole is greater than the sum of its parts”. Ginny Sykes explores memory and dreams in new mixed media sculptures. 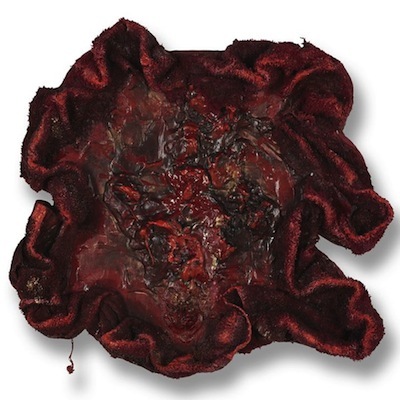 She uses recycled materials such as bones, wood, metal, and fabric collected through the years, adding paint to the surfaces. Sykes mixes abstraction and anthropomorphic form in a visceral aesthetic that cultivates a deliberate dissonance between beauty and ugliness. 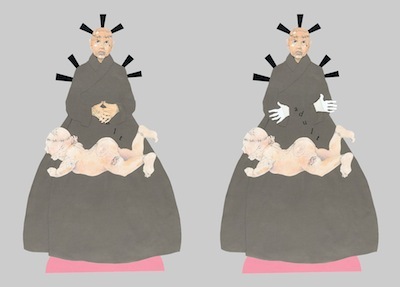 Informed by feminism and Jung’s theories of alchemy and transformation, these works are poetic “storytellers”, contemporary artifacts that speak of, and to the body; about its losses, pain, and survival. Brandy Kraft's recent series of oil paintings are about light and movement. Kraft recently studied in Stockholm, Sweden, where she spent one year studying in the painting/drawing program at Atelier Stockholm. 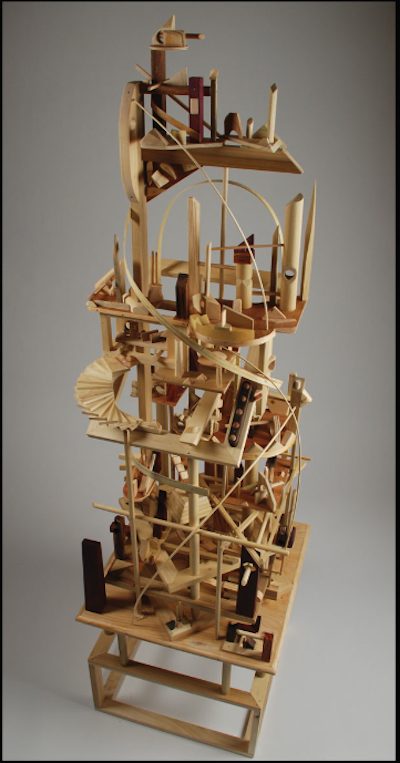 She is drawn to the sense of mystery that is transposed when trying to grasp the image of an object in motion. This feeling of ambiguity leaves the viewer with seemingly timeless or time suspended in air impression. Light, the fastest thing known to man, takes on a lethargic personality as it is portrayed listlessly wandering to the viewer’s eye. Her dynamic and colorful canvases capture just a split second of busy city life. Images of riding the subway, crossing the street, and bustling through a crowded subway station strike a connection in the heart of every metropolitan traveler. As humans we desire to reach an unattainable perfection. One way we have fulfilled our desire for perfection is by creating surrogates for ourselves, representations such as mannequins and sculptures. Art historians tell us that in ancient Greek sculpture formations standards were created for the ideal male body. This ideal that has been placed on stone and metal, also has been superimposed onto the real human body in contemporary culture. In this group of images, I have been exploring the idea that men in society today have been pressured to appear as the ideal male physique. The problems associated with body image problems are more commonly accepted as a women’s issue, but men today have been placed on an equal playing field. Practices such as plastic surgery and steroid use for men have become common. According to the American Society for Aesthetic Plastic Surgery, in 2003, men underwent 13 percent of all procedures. The ASPS reports that cosmetic plastic surgery procedures in men rose 2 percent in 2010 compared to 2009. (ASPS) The ideal is unobtainable when the body is not capable of achieving into the proportions that are considered perfect. This body of work has evolved over the semesters. I began creating a catalog of bodies of men and comparing the difference between them. I focused on the body parts that men concentrated on the most when working out. 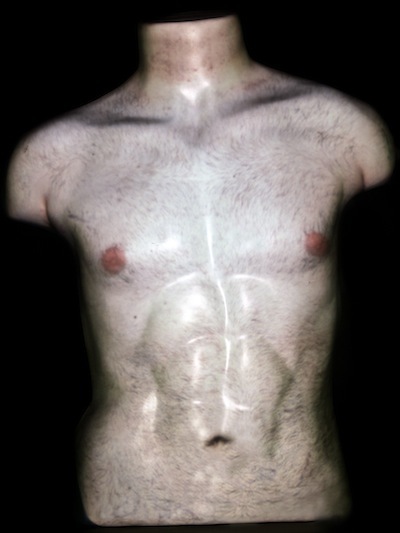 Eventually I began to project photographs of the normal torso onto the stylized ideal shape of a mannequin. Projecting the photographs of the normal bodies creates a juxtaposition that raises interesting questions about this ideal/real dialectic. I found that by using the virtual projection on the solid object I was able to express these cultural issues of men with body issues in a visual representation.